Many new treatments in cancer clinical trials tend to benefit a subset of patients more. To avoid unnecessary therapies and failure to recognize beneficial treatments, biomarker threshold models are often used to identify this subset of patients. We are interested in testing the treatment–biomarker interaction effects in a threshold model with biomarker but an unknown cut point. The unknown cut point causes irregularity in the model, and the traditional likelihood ratio test cannot be applied directly. 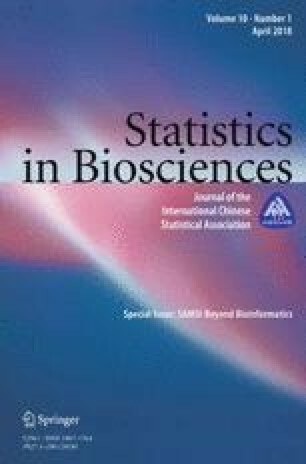 A test for biomarker–treatment interaction effects is developed using a residual bootstrap method to approximate the distribution of the proposed test statistic. We evaluate the residual bootstrap and the permutation methods through extensive simulation study and find that the residual bootstrap method gives accurate test size, while the permutation method cannot control type I error sometimes in the presence of main treatment effects. The proposed residual bootstrap test can be used to explore potential treatment-by-biomarker interaction in clinical studies. The findings can be applied to guide the follow-up trial design using biomarker as a stratification factor. We apply the proposed residual bootstrap method to data from Breast International Group (BIG) 1-98 randomized clinical trial and show that patients with high Ki-67 level may benefit more from Letrozole treatment. This work was supported in part by the Grants from the Natural Sciences and Engineering Research Council of Canada (NSERC). The computation was made possible by the facilities of the Shared Hierarchical Academic Research Computing Network (SHARCNET: www.sharcnet.ca) and Compute/Calcul Canada. The authors would like to thank the referees and the Editor for their insightful comments and suggestions.